Shot in ISO 400 with a Canon XTi. What can I do to get better detail and clarity? Aside from the comments already made about the use of RAW and ISO, I am also thinking of a better composition. Personally, I don't like the amount of dead space at the bottom of the photo, nor to the left. You could easily crop out those three balls on the left and the empty table in the foreground. Also, I really don't like the way the pool player is holding his left hand. 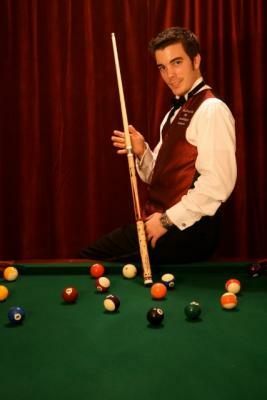 I would prefer to see him hold the cue. Here's a suggestion - how about getting close to the table to take the photo, maybe even resting your camera on the table itself. There would then be this dominant foreground, some large balls (tapering out in size as we near the pool player), and the pool player standing proudly above it all. I like your shot, and for a first attempt at a lighted portrait I think you have done well. I have a question though - why did you shoot at ISO 400? You would have got better clarity from shooting at ISO 100. As this is a portrait your subject could easily have stood still for the exposure (probably would have been about 1/15 of a second) Assuming you had the camera on a tripod you should have been OK.
Also, did you shoot in RAW or JPEG? You would get better detail and clarity from RAW, then convert it in Photoshop. A little sharpening in Photoshop would do wonders! By the way, what lens did you use? The lighting seems spot on though - well done there! That's one of the most difficult parts of portrait photography.